AMC's Great Kids, Great Outdoors: Teen Trail Crew: "brute strength is not a requirement"
Teen Trail Crew: "brute strength is not a requirement"
Two years ago this month, Lori Sklar leafed through a magazine from her insurance company. She saw an article about AMC's trail crew programs for teenagers — and immediately thought of her son. Noah Kantro was a sophomore in their Long Island community’s high school, an enthusiastic Boy Scout drawn to camping and hiking. Would he like to sign up for a trail crew in the Berkshires? Would he ever! 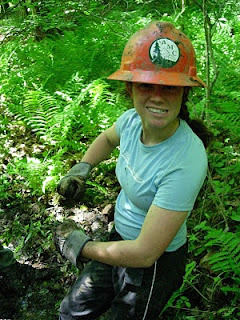 This summer, teenagers with a similar desire to get their hands dirty can choose from 25 AMC trail crew opportunities. Projects range from clearing brush, blowdowns and drainage ditches to constructing rock cairns, building bridges, and cutting new trails. The programs run from one week to four weeks in the Berkshires or the White Mountains. Some crews work out of base camps; others set up in the backcountry. Trail crews are open to boys and girls between the ages of 15 and 19, though age ranges vary slightly, depending on the specific crew. Longer programs, such as the Berkshire Trails Leadership Crew, include training in wilderness first aid, Leave No Trace camping, and outdoor leadership. "I had no idea what to expect," Kantro says of his first year on trail crew. Most first-year participants come to the program with similarly little trail-work experience, according to Regional Trails Coordinator Matt Moore, and may not have much backpacking experience, either. What participants tend to share is openness to new experience and willingness to work as a team. Groups are typically split about 60/40 between teenage boys and girls, although young women usually fill more than half the crew-leader roles. "Brute strength is not a requirement," Moore says. "Trail work is about using tools intelligently." Trail crews use their tools on eight-hour days that frequently involve hiking several miles and carrying loads between 40-60 pounds. Some of the crews tent near their work areas, and all promise plenty of hard work, bugs, and blisters, rain or shine. Kantro returned for a second tour in 2009, helping build a stone staircase on a steep, "nasty" section of the Haley Farm Trail on Mount Greylock, and a "crush pit" across a muddy stretch. Now a senior in high school and planning to study engineering, he wrote his college application essay about "an experience in which immense natural beauty and grueling physical work combined into one of my fondest memories." Regional Coordinator Moore can tell by the crunch of tires in the gravel driveway of the Berkshire trail crew office when the nine-passenger van pulls in at the end of a program. And he can tell something else without looking. A group of teenagers goes into the woods at the start of each program, he says. But every time a van returns, it’s a trail crew that steps out. Trail crews fill up quickly. Register online. Read blog posts from the 2009 trail crew season. 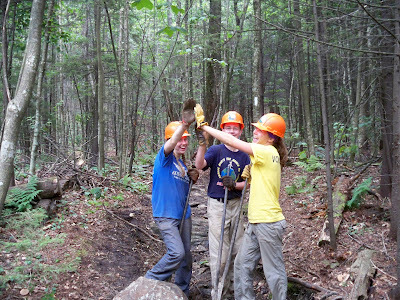 Images: AMC teen trail crews enjoying their work on the Appalachian Trail in western Massachusetts. Photos by Phil Kolling.